Coming in a .177 format, Full power performance meets totally practical, no-nonsense design in this seriously handy, break-barrel sporter. This is the rifle for hunters who want top performance at an affordable price in a proven, hard-hitting package. This rifle is designed to provide years of service in the hunting field and it has all the features to do just that. The specially weighted piston and mainspring are calibrated to deliver full, consistent power, manageable recoil and thousands upon thousands of shots with minimal maintenance. 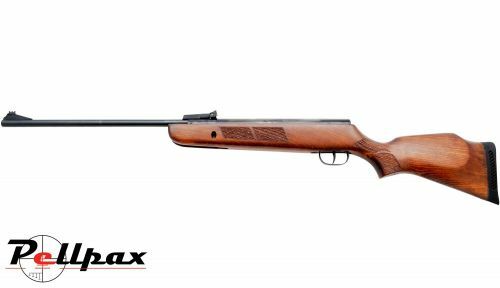 Incorporating BSA’s superb, adjustable open sights and a full-length scope mounting rail, the Supersport’s accuracy is fully supported by a two-stage, adjustable trigger high quality barrel and a practical stock design. Add this item to your basket & spend an extra £281.00 to apply for finance.